Marian Hamilton was lead author (co-authors included Dr.Lee Drake, Dr.Chip Wills, Cyler Conrad, Dr.Patty Crown and Dr. Emily Jones) on an article published in American Antiquity in January 2018 entitled “Stable Oxygen Isotope Sourcing of Archaeological Fauna from Chaco Canyon, New Mexico.” To read the full article, click here. Marian will receive her doctoral degree this semester and has accepted a tenure-track position as Assistant Professor at the University of Northern Colorado. 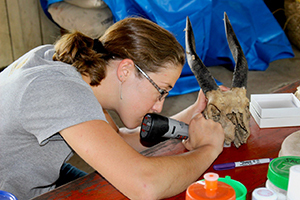 Her research focuses on reconstructing hominin habitats and behavior through comparisons with living primate systems.